The church of St Mary, with its pretty tower and clerestory, and spectacular flint flushwork, has been ill-served by the A12 London to Ipswich road, which thunders past barely 50 yards away, and cuts the church off from its village. The last time I visited, I cycled to the church from East Bergholt. The lane took me to the A12, but I was relieved to discover that a tarmac pathway ran on the verge beside the four lanes of traffic. About a mile short of Stratford St Mary, guess what happened? The track simply stopped. I had to continue the journey along the rutted and littered verge among the drbis from car accidents and broken windscreens. It was a miracle that I did not get a puncture. 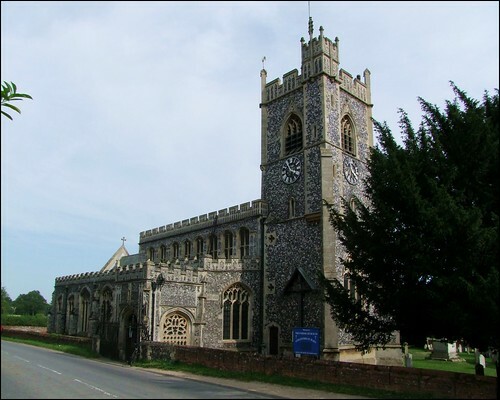 St Mary is the first Suffolk church that most visitors see, standing as it does immediately beside the flyover which thankfully allows access from village to church without crossing the carriageways. The church stands as a beacon on the Suffolk/Essex border, but it has also been ill-served by one of the least sympathetic Victorian restorations in either county, of which more in a moment. But first, that flushwork. A half mile away to the south stands the church of St Mary, Dedham, a similarly spectacular affair, with flint flushwork decorating the tower and clerestory. The obvious rivalry between the two is heightened somewhat by the fact that Dedham is in Essex, on the opposite bank of the Stour (and therefore beyond the scope of this site). The exterior of the church is all very neat and trim; clearly, the Victorians did a bit of tidying up. But their care has left behind much detail, as well as two grand dedicatory inscriptions, which run around the north-east chapel and the length of the north aisle. They translate into modern English as Pray for the souls of Edward Mors and Alice his wife and all Chrstian souls in the year of our Lord 1530 and Pray for the souls of Thomas Mores and Margaret his Wife who had this aisle built in 1499. The Mors family merchant mark is on a buttres with an EA monogram (for Edward and Alice) and an AMR for the Blessed Virgin. Margaret Mors and John Smith have their initials on the porch. Other letters scattered here and there seem random, perhaps meaningless; Mortlock thought them connected with a breviary ritual, and unique in England. Other people have suggested that they are occult symbols, and a dull-headed pseudo-mysticism more suited to the pages of The Da Vinci Code has been claimed for them. Whatever, there is nothing else like it in East Anglia. The late medieval north porch opens directly on to the road. As a consequence of this, it had a processional way cut through it, as at Aldeburgh. This was later filled in, and the Victorians replaced the infill with two fine traceried windows in a near-flamboyante style. You step inside, perhaps with your breath held in anticipation of the sort of interior you'd expect from similarly spectacular exteriors at Eye and Stoke by Nayland. But this church has been wholly Victorianised inside, in a lukewarm, middlebrow ritualist fashion more suited to a minor urban church than a prominent East Anglian country church. The marble chancel arch and pulpit look as if they were designed specifically for some inner-London Anglo-catholic shrine, and then at the last moment installed here instead. The chancel and side chapel are rather better, despite the ugly screening. The side chapel is prayerful and trim, and also contains a high Victorian credence in the style of a piscina in the north wall. A lovely cross is set into the mosaic in it. It is all, perhaps a matter of taste. But, like so many Suffolk churches, this one was in a very poor condition by the 19th century, and something had to be done. In general, the earlier in the century restorations were carried out, the more attention they paid to vernacular styles and local needs. But not here, for you could as easily be standing in a church in London, or Paris, or Calcutta. Or even Essex. Perhaps, if the exterior was not so spectacular, it would not matter so much. The worst feature is, I fear, the ugly font, with its poor reliefs; it is a good match for the uncomfortable glass in the clerestory. What can they have been thinking of? Unlike that in the clerestories, the glass in the east window is very good indeed: 1890s work by Powell and Sons, and shows four scenes from the early life of Christ. And St Mary is not without its medieval survivals. Set in the west window of the north aisle is some very pleasing 15th Century glass. The best figure is that of St Jude - presumably there were, at one time, eleven other Apostles in this sequence. The tracery glass depicts Old Testament prophets - again, there once must have been others. Could it have been commissioned by the Mors family for their new aisle and chapel? Even if not, it is a taste of what the Mors family knew when they were here, and what was lost to us long before the Victorians came along.